Sarah Bergbreiter and Ryan St. Pierre at the Hilton Head Workshop. 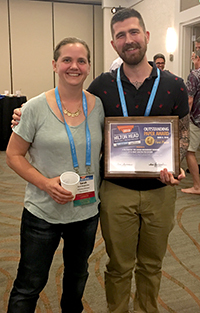 Congratulations to brand-new Maryland alumnus Ryan St. Pierre (ME Ph.D. 2018) and his former advisor, Associate Professor Sarah Bergbreiter (ME/ISR), for winning the Best Paper Award at the 2018 Hilton Head Solid-State Sensors, Actuators and Microsystems Workshop. Their paper, “A 3D-Printed 1 MG Legged Microrobot Running at 15 Body Lengths per Second,” was selected from among six finalists. This is a significant honor within the MEMS community at its prestigious meeting. St. Pierre will continue his association with Bergbreiter in the fall as a postdoctoral researcher. The third co-author on the paper, Walker Gosrich, (B.S. Mechanical Engineering 2018, University at Buffalo), spent last summer as a researcher in Bergbreiter’s Microbotics Laboratory. Gosrich will enter the University of Pennsylvania in the fall as a Ph.D. student in Mechanical Engineering.